The LPD25-15B Alpha heat sink offers a natural convection thermal resistance rating of 15.6 °C/W within a 25mm square footprint. The elliptical shaped, aerodynamic fins are set in a sparse pattern which makes it easier for air to efficiently flow through the heat sink, making this cooler an ideal choice for either passively or actively cooling high power LEDs. Made from highly thermal conductive A6063 black anodized aluminum alloy, the fins and the base are forged from one solid piece of aluminum under tremendous pressure, completely eliminating any performance-robbing interface between the base and fins. The mounting surface of the heat sink is completely smooth and flat, making it most suitable for mounting LEDs using either self adhesive thermally conductive tape, or adhesives. 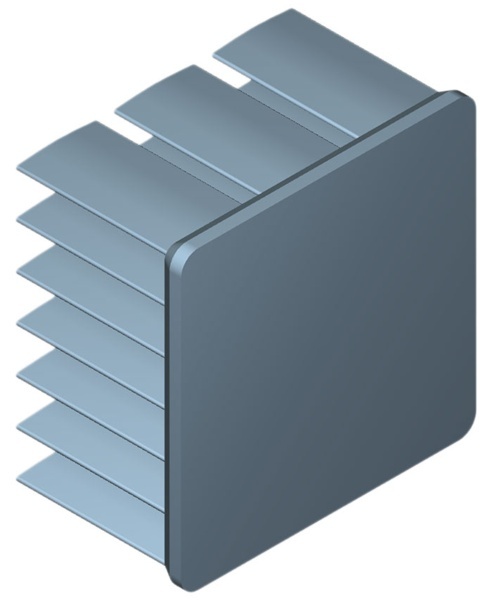 Need help selecting a heat sink for your application? Check out our handy heat sink information page and calculator.